Snow White super weight, .001 Mil thickness 21" wide, 42" long with a 3" gusset on each side. 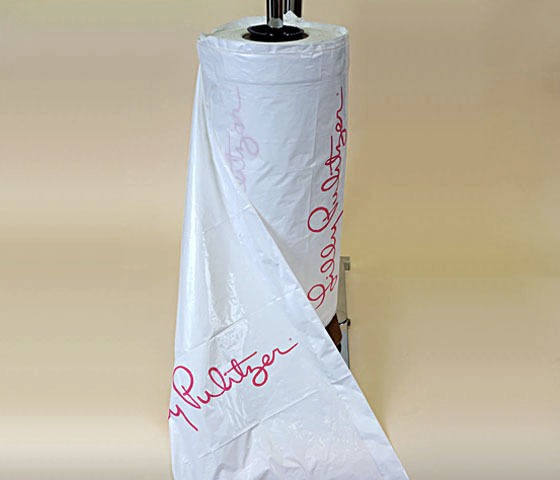 Price includes 1 color imprinting.428 bags per roll perfect ,for blouses . Price listed is for 1 color printing on 1 side. Additional charge for 2 or 3 color printing or printing on 2 sides.Imprint repeats every 18 inches!! 1st time plate charge $75-$100. Minimum 5 rolls.You can combine sizes to obtain quantity pricing. Call our Art Department at Ext.104 or live chat for easy ordering. Ink colors: All standard colors.